The cause of 38-year-old actor Corey Haim's death remains a mystery. But friends have said Haim had the flu and a fever in the hours before his death, "Early Show" National Correspondent Hattie Kauffman reports. Police say he was taking over-the-counter and prescription medications when he collapsed at a Burbank, Calif. apartment complex Wednesday morning. Corey Feldman, Haim's best friend, told "The Early Show," "I don't think it was a suicide, and I don't think it was an intentional overdose." Feldman and Haim first worked together on "The Lost Boys" 23 years ago. Feldman says he spoke to his Haim earlier this week. Haim was caring for his mother, who has cancer. Feldman said, "This is a man who was pushing forward and more than anything in the world wanted to be there for his mother." Haim was just 12 years old when he landed the film "Firstborn," and quickly became a teen heartthrob in Hollywood movies of the 1980s. But with fame came addiction. Feldman said, "He's been battling addiction his entire adult life, I mean, literally since he was 15 years old." Haim and Feldman made eight films together, but both struggled to make the transition into adult roles. Haim's lifelong battle with drugs eventually played out on a reality series on A&E network called "The Two Coreys." 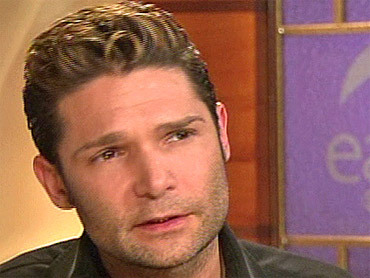 Feldman told "The Early Show," "He made so many attempts at suicide. He's OD'd so many times. I mean, I can't begin to tell you having him foaming at the mouth, coming down stairs and finding him that way and drooling and not able to speak, and me, having to put charcoal down his throat so that he could breathe." Just weeks ago, Haim told a crew from the celebrity news Web site TMZ he was clean and sober. When asked if he was clean, Haim replied, "Yeah, I have been for awhile now." Feldman told "The Early Show," "He made a lot of mistakes. But he always had his talent he always had his skill and he always tried to be the best person he could." What actually happened the night Haim died? Mark Heaslip, Haim's agent, said on "The Early Show" Thursday he'd spoken with Haim's mother. "(She said) Corey was running a fever, (a) 99 to 101 temperature, and I didn't even get a chance to talk to Corey. I talked to him the day before that; (His mother) said he's resting, he didn't look like he was overdosed at all. He was just running a temperature. He was laying in bed. And that night, Corey, he went to sleep, and he asked his mom to come into the room because he was having breathing problems, 'Would you lie next to me in bed?' So she laid next to him in the bed, and she told Corey to roll on your side to see if it would help you breathe better and Corey said he started feeling better. So they both went to sleep, and then between 12 and one, she heard someone walking around the room and she opened her eyes and it was Corey and he just fell right to the ground." "Early Show" News Anchor Erica Hill asked Heaslip if he'd been expecting something like this from Haim. Heaslip said when he brought Haim on, he saw an improvement in the star. "When he was doing his films, he was sober on the set," he said. "He was motivated. He was in Frisbee. On breaks, he was throwing his Frisbee around. He really pulled away from the pills and he was getting his life together. He was excited about his life. He was getting movies again. He was supporting his mom with the cancer. He was taking her to all the appointments. It was a shock. The whole thing is a shock to me." But psychotherapist Dr. Nicki Monti, who worked with Haim on the A&E reality show, "The Two Coreys," said she wasn't surprised by the news of his death. Monti, the author of "Stuck in the Story No More," said she deals with addiction all the time. "I watch people make the choice for tragedy instead of healing," she said. "It's a little like driving your car fast over and over again, and at some point, you get a ticket. You're always surprised to get that ticket. However, it's only the time you're caught." Monti pointed out Haim's own words that he was a "chronic relapser." "From my point of view, Corey, as charming as he was, and as really, just full of energy and potential, he had a constitutional inability to be honest with himself at a deeper layer," she said. "And when you're not honest on a deeper layer -- when you don't look the dragon in the eye, you can't battle the dragon, you can't fight the dragon, and you certainly cannot conquer the dragon."